The Royal Academy of Fine Arts of the United Kingdom presented the Lewis & Clark Award to Laban Pen Corporation as the Best Writing Instrument of 2004. Laban is commited to the manufacture and worldwide distribution of Laban pens and mechanical pencils that are of a singular high quality. Laban writing instruments are of a good value and are designed for a lifetime of use and writing pleasure. To that goal, Laban has invested in top quality materials, the latest technology for its manufacturing processes, coupled these with Old World Craftsmanship and stringent quality control. 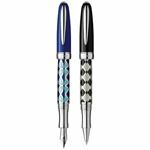 For over twenty two years Laban is working with the highest quality acrylic resins, brass and precious metals with Laban's artistic flare and artisan care, are fashioned into the striking designs you see in today's Laban writing instrument lines. Laban sincerely invites you to join writing with them.